Proteins are complex, organic compounds composed of many amino acids linked together through peptide bonds and cross-linked between chains by sulfhydryl bonds, hydrogen bonds and van der Waals forces. There is a greater diversity of chemical composition in proteins than in any other group of biologically active compounds. The proteins in the various animal and plant cells confer on these tissues their biological specificity. (a) Simple proteins. On hydrolysis they yield only the amino acids and occasional small carbohydrate compounds. Examples are: albumins, globulins, glutelins, albuminoids, histones and protamines. (b) Conjugated proteins. 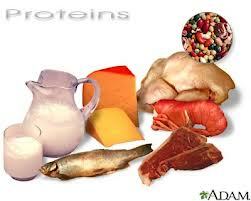 These are simple proteins combined with some non-protein material in the body. Examples are: nucleoproteins, glycoproteins, phosphoproteins, haemoglobins and lecithoproteins. (c) Derived proteins. 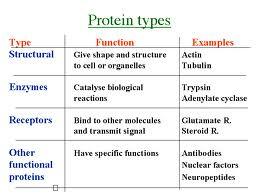 These are proteins derived from simple or conjugated proteins by physical or chemical means. Examples are: denatured proteins and peptides. The potential configuration of protein molecules is so complex that many types of protein molecules can be constructed and are found in biological materials with different physical characteristics. Globular proteins are found in blood and tissue fluids in amorphous globular form with very thin or non-existent membranes. Collagenous proteins are found in connective tissue such as skin or cell membranes. Fibrous proteins are found in hair, muscle and connective tissue. Crystalline proteins are exemplified by the lens of the eye and similar tissues. Enzymes are proteins with specific chemical functions and mediate most of the physiological processes of life. Several small polypeptides act as hormones in tissue systems controlling different chemical or physiological processes. Muscle protein is made of several forms of polypeptides that allow muscular contraction and relaxation for physical movement.